The Sunbrella<sup></sup> Hammock combo is our top choice to challenge the elements. The double hammock is made with Sunbrella<sup></sup> fabric to outlast every season, year after year. It is as comfortable as cotton, creating the perfect refuge for an afternoon snuggle. The stand is constructed of heavy duty steel and assembles in minutes without any tools. Plastic caps top the ends of the steel tubing to create a soft finish. The stand provides you the freedom to setup your hammock in the most convenient location and no longer rely on those two perfect trees. Token Surfside 9 ft. Sunbrella Hammock with Stand The Sunbrella<sup></sup> Hammock combo is our top choice to challenge the elements. 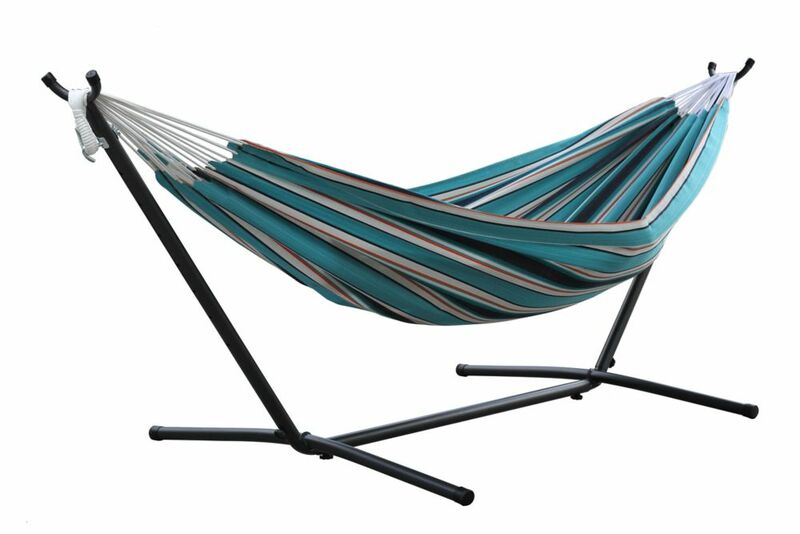 The double hammock is made with Sunbrella<sup></sup> fabric to outlast every season, year after year. It is as comfortable as cotton, creating the perfect refuge for an afternoon snuggle. The stand is constructed of heavy duty steel and assembles in minutes without any tools. Plastic caps top the ends of the steel tubing to create a soft finish. The stand provides you the freedom to setup your hammock in the most convenient location and no longer rely on those two perfect trees.